If you’re looking for ideas for beach themed bedrooms, you’ve come to the right place! 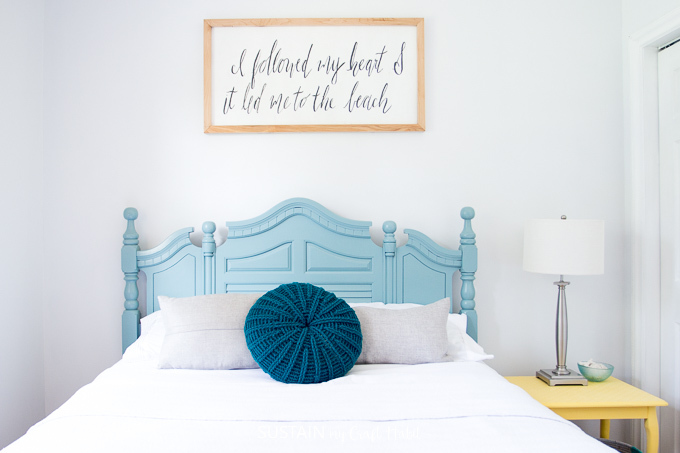 In this latest makeover of our Graystone Beach cottage, we’re sharing budget-friendly DIY ideas for a beach themed bedroom retreat. 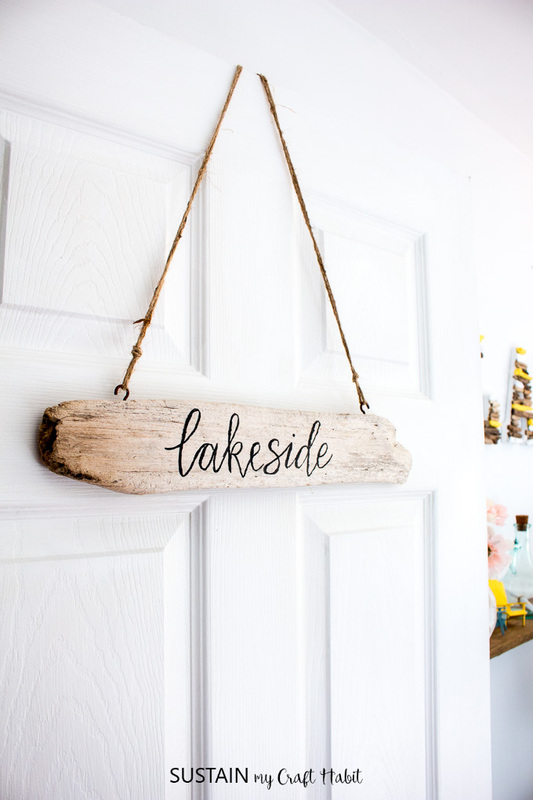 It’s hard to believe that it’s been nearly three months since we shared the beach themed bedroom mood board for the Lakeside Room of the Graystone beach cottage. 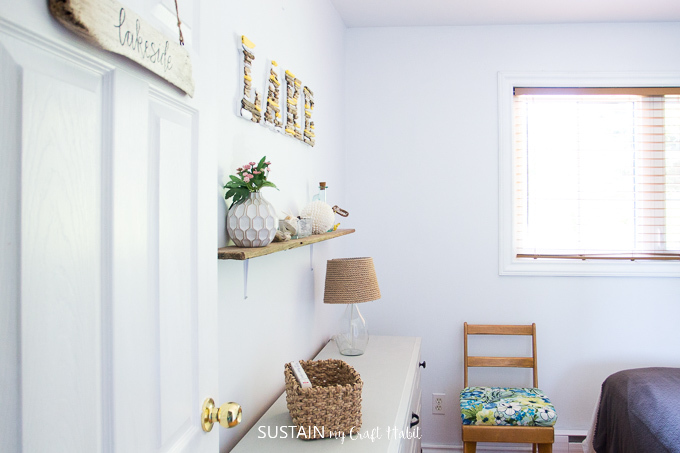 Over the last eight months we’ve been renovating our small two bedroom family cottage near the shores of Lake Huron, Ontario. 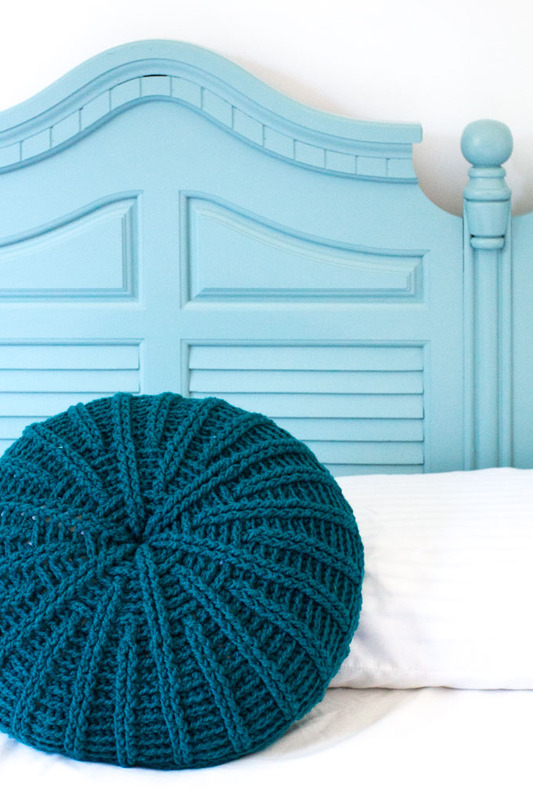 If you’d like to check out some of the previous makeovers, be sure to check out the coastal decor ideas in the Orchardview bedroom as well as our “Touches of Teal” beach themed bathroom remodel. Whereas we were going for a serene and calming space for the Orchardview bedroom makeover we aimed to make the Lakeside bedroom a little more colourful and fun. So in our mood board you’ll find beautiful teal colors, natural wood accents and pops of sunshiny yellow. We think we stayed pretty true to our original design plan in the final room. 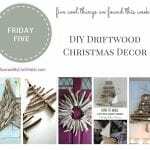 We don’t have a lot of money for this cottage renovation so we aim to upcycle and repurpose where we can and to invest the money into the areas where it’s needed (e.g. the bathroom and kitchen). 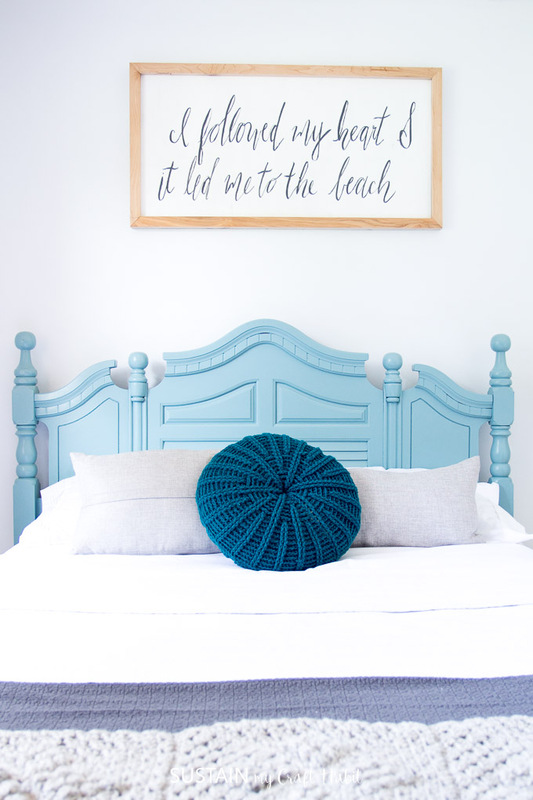 Our goal with the Lakeside room was to update furniture with some paint and add some fun beach themed bedroom accessories. We are happy to share a video tour of our new coastal bedroom on our YouTube channel here. 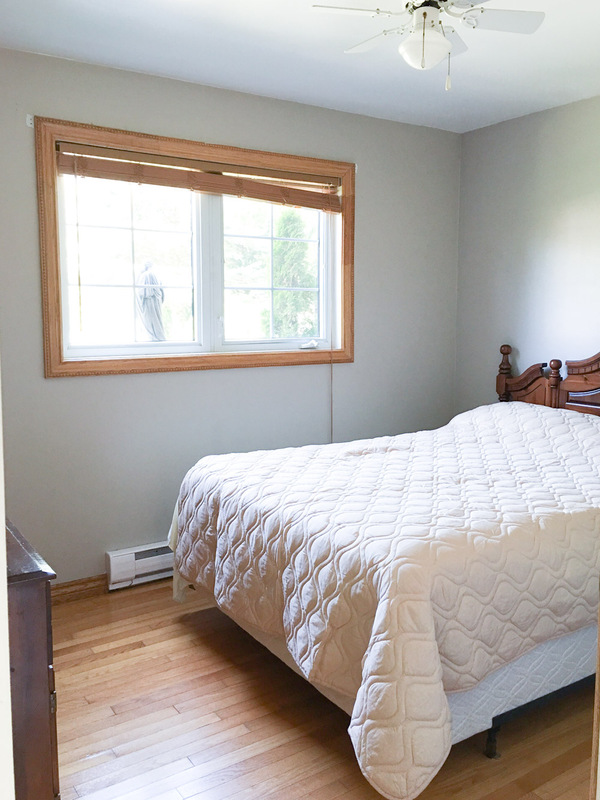 We started by painting the bedroom walls the same color as the Orchardview Room: Melting Glacier by Beauti-Tone. 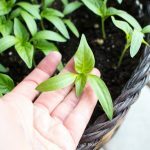 It’s a cool and crisp white that provides a nice clean canvas for the rest of the decor and ideas. As often happens with a cottage, it is the place where furniture hand-me-downs come to find a new home. The furniture pieces in the room included a bedroom set which our parents purchased in the eighties. 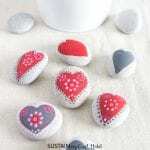 We painted them in different beachy colours to achieve the coastal cottage furniture vibe we were aiming for. 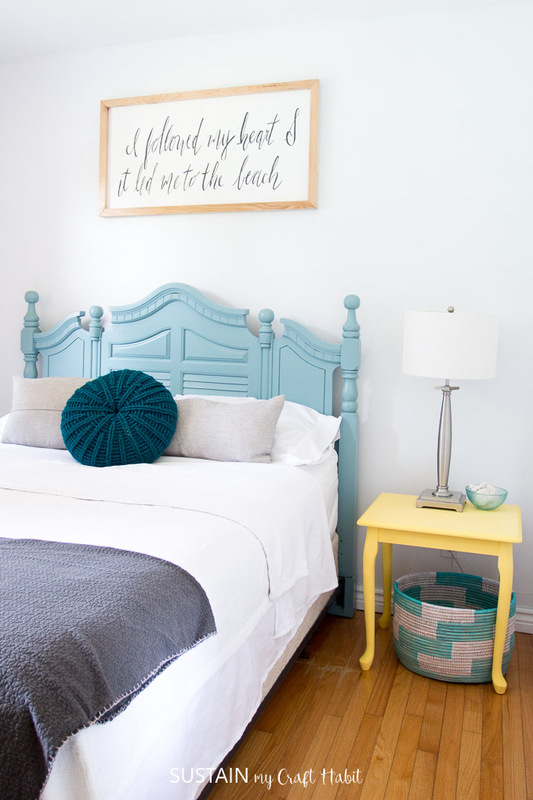 First, we painted the headboard a fun teal colour as we shared in this tutorial on how to paint wood furniture the easy way. 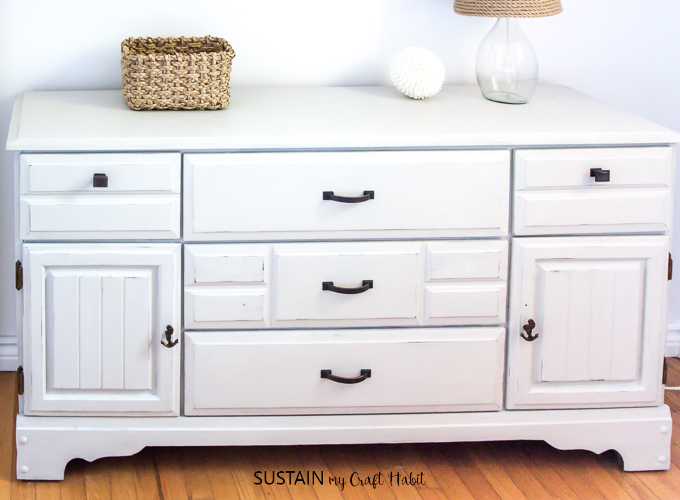 We removed the mirror on the large, dark wood dresser and transformed it to a light gray unit (see how to paint a wood dresser using Country Chic Paint). 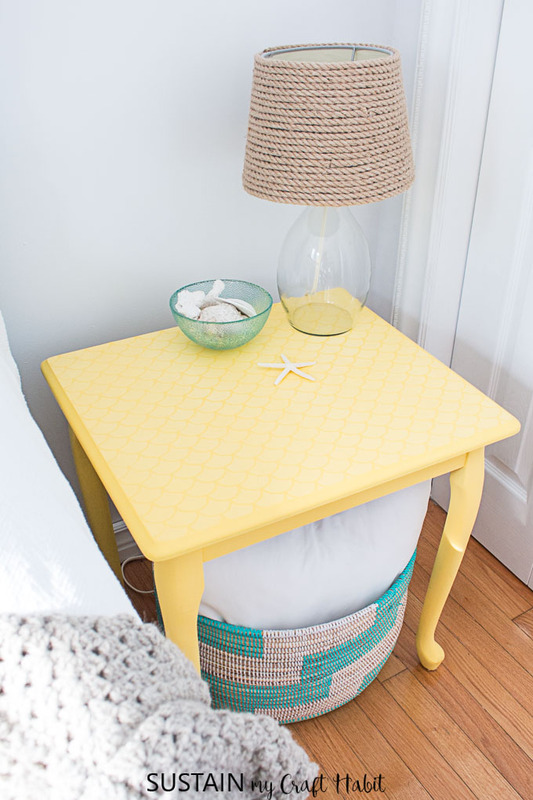 Finally we painted a little side table a bright yellow pop of color with chalky finish paint and a fish scale stencil. 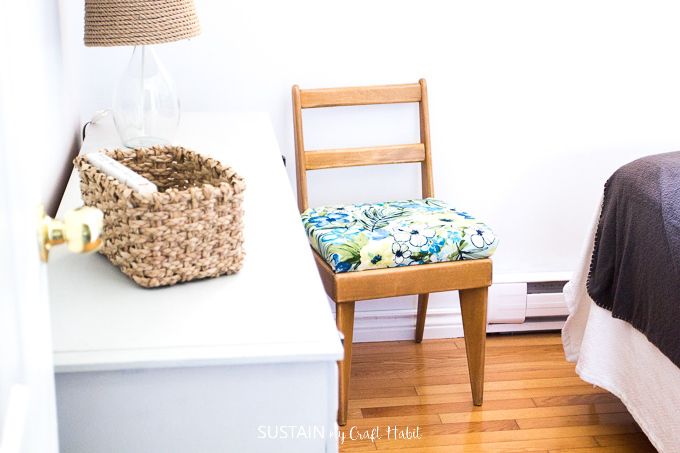 We also reupholstered a wooden chair that Jane found at a local thrift store for $4! The colourful, almost tropical print is perfect for the room. Above the dresser we mounted a DIY wall shelf using driftwood for less than five dollars. 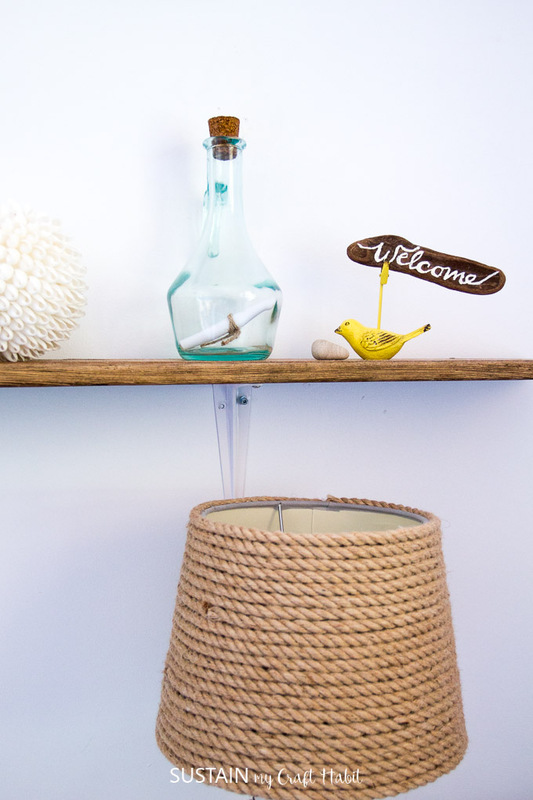 This makes the perfect storage space for some fun coastal accessories. 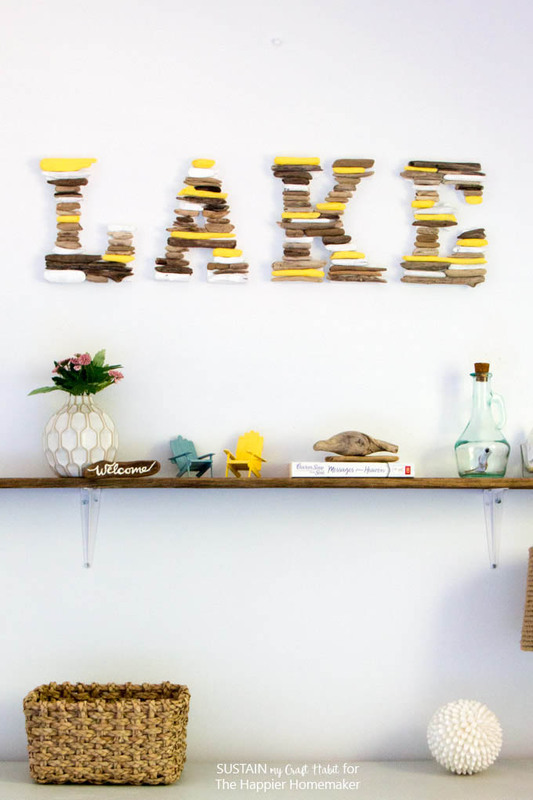 Above the shelf we added a hand-painted driftwood LAKE sign to add some color and texture to the wall. We painted several thrifted open-backed wood frames in coordinating colours and hung them by the window. Finally, on the wall above the bed we made a farmhouse sign on which Jane hand-lettered “I followed my heart and it led me to the beach”. The bedding is a nice crisp white with a few throw pillows (including our Sand Dollar crochet throw pillow) and blankets for accessories for those cool Lakeside nights. And there she is! Our new beach themed bedroom. 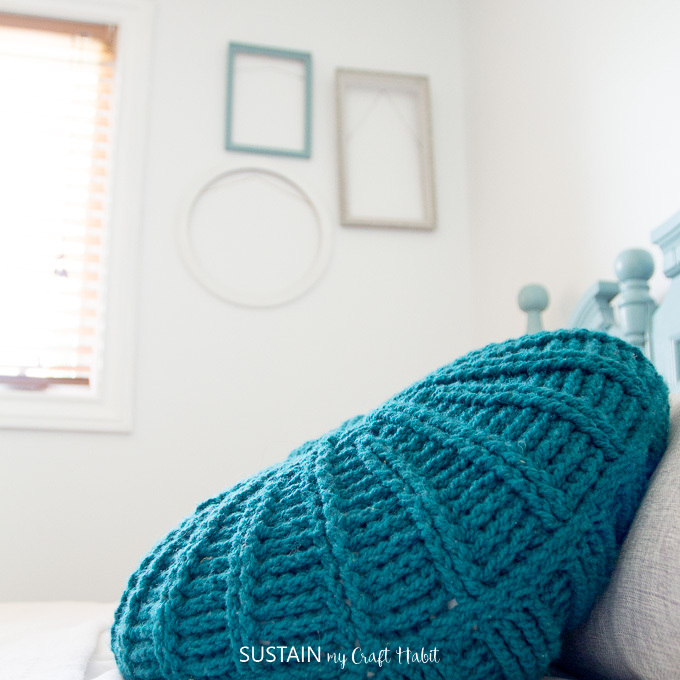 For less than $100 we have a fresh and fun new beachy bedroom retreat. When we find them, we’d love to add some simple white sheer panels* to the window as well as a small jute rug* beside the bed. Otherwise, we are all set for summer vacation next year! What images come to mind for you when you think of beach themed bedrooms? 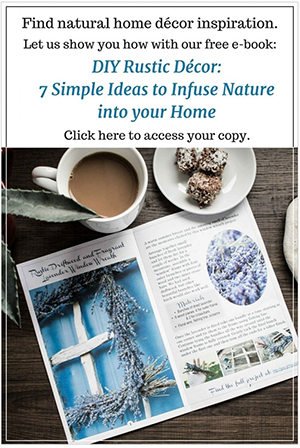 I love your colour scheme in your coastal cottage makeover, it’s so happy and inviting and sure to create that calming and relaxing vibe I would want on a get-away. The kitchen cabinets in two different colors is also really interesting, I haven’t seen that before and I think it worked out brilliantly.